Local Internet Marketing | Orange County SEO Company, Inc.
Do you know the difference between a local landing page and other types of web pages? If not, it is important that you learn the secrets to creating a great landing page that will attract local traffic and share your information with local customers. What does a local landing page need to be successful in local SEO marketing? 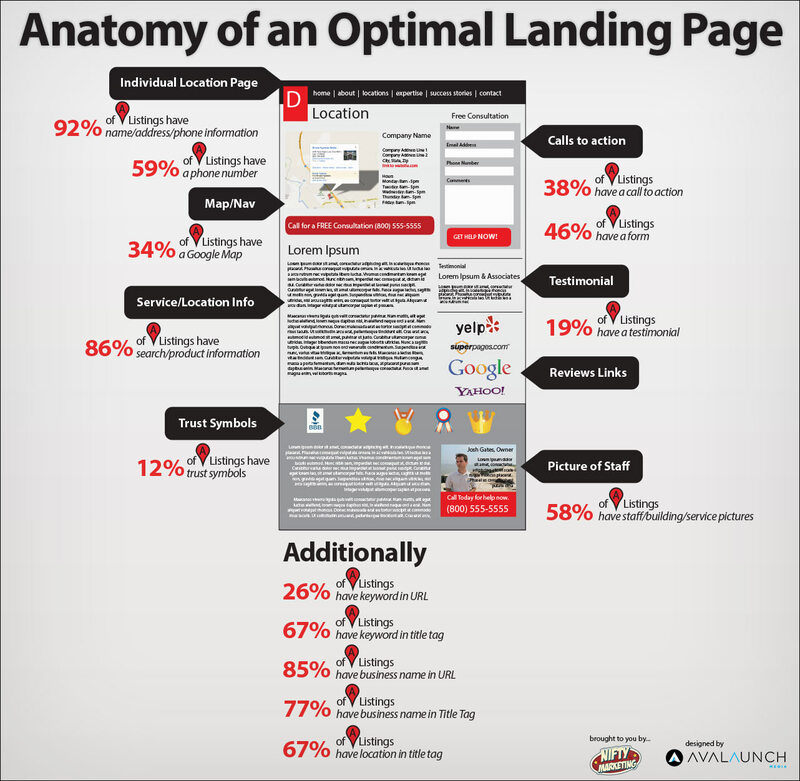 This infographic explains key points that a landing page must have to drive business to your website. 1) 92 percent of optimal landing pages have important contact information such as name, address, phone, and location. It is surprising how many local pages neglect to put this critical information in a prominent spot so that anyone who needs to can easily contact the company. While there may be good reasons to conceal direct contact information in a nationwide campaign, there is rarely any reason to do so on a local landing page. 2)59 percent have a phone contact in addition to email. Most local business have phone service during certain hours of the day. It is a good idea to provide a local phone number, since many people, especially older shoppers, appreciate being able to talk directly to the company. 3) 38 percent have a call to action. A call to action is a short piece of text that encourages customers to shop and buy locally with a particular vendor. This call to action should not be salesy but should encourage customers to buy by giving them a good reason and a clear course of action. 4) 46 percent have an easy-to-complete contact form. Contact forms should be minimal but should capture essential information: Name, phone and email can suffice in many cases. 5) 34 percent have a Google map. Google maps are some of the most underutilized resources in local web pages. A Google map is simple to install and shows customers exactly where a business is located. Many people use Google maps to determine the relative distance to businesses or to find landmarks that will guide them to the location. 6) 86 percent have product information. A local landing page is a great place to highlight your most important products as long as you do not make the page too crowded. The page should never have a catalog of products, but it is a good idea to highlight the type of goods or services your business offers. 7) 19 percent have testimonials. A short testimonial from a satisfied customer can drive customers toward your site quickly and establishes a sense of trust with your base. Customers like to know that others have used your services successfully. 8) 12 percent have trusted symbols of associated organizations. The Better Business Bureau, professional organizations and other groups offer logos that can be used if you are a member. These trusted symbols also build confidence with your customers. 9) 58 percent have staff photos. Staff photos help customers identify those who work in your organization and allow them to make a connection with them. 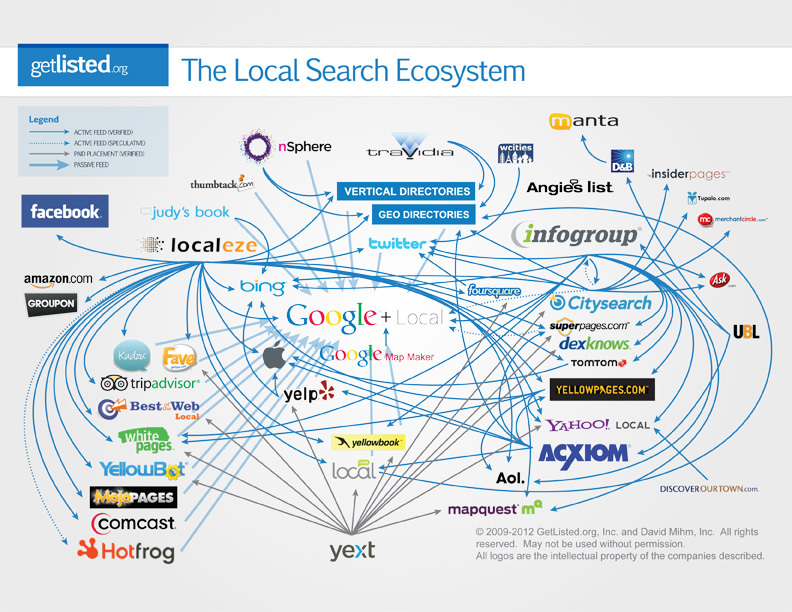 Local searches are becoming the key factor in building business over the internet. At one time, web designers and SEO experts concerned themselves only with the global picture, since most local advertising was done through other media. Changes in search technology and smart phone capabilities, however, have changed the dynamic. Today’s customers are looking for businesses close to home, and local search optimization helps them find you. This is true whether the searcher is a native of your area or a visitor. If you take a trip out of town, for example, your smart phone can help you locate stores, restaurants and services in your new geographic area. Guess which businesses show up on these searches? The ones who are optimized for local search capabilities, of course! Local search optimization is like taking out a virtual billboard at the city limits of your location. You attract incoming shoppers to your website or your location and help them find your services easily when you have taken steps to make local searching easy. Local search techniques not only take into account your location but also your “findability” on mobile devices, through GPS systems and other factors that can affect your users’ experiences. • Understand what is at stake. By 2015, nearly a third of searches will have local interest. This number is currently climbing every day as the smart phone takes the place of traditional cell phones. • Improved integration and mobilization are driving local search numbers. You cannot keep up if you do not pay attention to mobile use issues. • 77.1 million mobile users also use local searches, especially when visiting unfamiliar cities. • 74 percent of these searches originate in Google’s portal. Google is still the standard for map-based searching, although other companies are quickly rising in popularity. • At least 14 percent of users say they search locally every day. • Only 15 percent did not find the results useful. The majority of these were led to websites that simply were not structured to support local searches or lacked vital information, like a phone number. • 37 percent say images were likely to grab their attention. A picture is worth many words. • 81 percent of businesses include a phone number with their listing for easy customer access. Many also include fax, URL for a website, or even interactive capabilities—such as making reservations online. Face it, local search capabilities are something you cannot afford to ignore if you want to grow and expand your business. In order to make the most of this opportunity, you may need the help of an experienced and professional web designer who understands local search optimization. If you are in need of professional search engine marketing from an experienced Orange County SEO company, please call us at 949-494-0007. Orange County SEO can help you optimize your web presence to include local search considerations and make the most of your web presence—wherever you are.